Dedicated to the mighty and invincible Hindu goddess, Durga is a 5-reel 4-row 40-payline video slot machine recently published by Endorphina that comes with re-triggerable Free Spins, Wilds, Expanding Wilds and a Risk Game where you can score 2500-coin jackpot and get some extra multipliers. 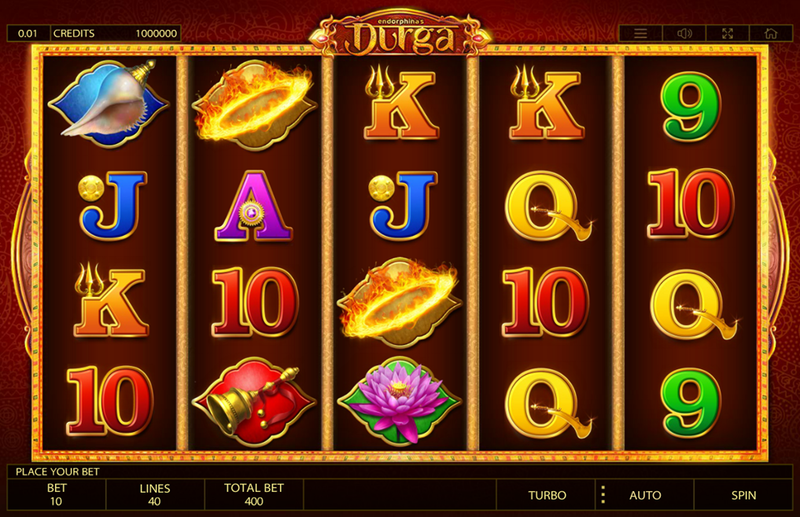 You can play for fun or wager for the real money, so read the Durga slot review and find out all the particulars. Want to see how Durga works? Select a recommended casino site from the list below and start playing for free or real – our screenshots will give you a sneak peek! Combine 3-5 icons of the same kind to form a winning combination. The paytable features nicely-animated symbols where themed ones pay up to 2500 coins when 5 of the kind are collected. Lion is the Wild icon that replaces any other except the scatter and may additionally improve your rating since it turns into an Expanding Wild and brings multipliers of 2x or 3x. You can choose to start the Risk Game after each winning round and gamble on the color of the next card up to 5 times. This could be a good strategy if you feel strong and lucky enough, but you’ll lose it all in case of a wrong answer. Moreover, there is a variety of betting combinations with coins valued from €0.01 to €0.5 and possible wagers from €0.40 up to €200. You’ll receive 28, 16, 11 or 7 bonus rounds if manage to collect at least 3 scatters that will turn the Durga Free Spins round on. Each scatter is associated with a multiplier meaning that winners will score a prize of 2000 coins and receive 1-5x multiplier applied to their winnings. A few tips: watch for the Expanding Wild and its possibility to add extra multipliers. Mobile gaming is enabled even without a need to download an app for Android or iPhone. Durga free play mode exists on all Endorphina-powered sites where you can learn how to win before start playing for cash. 3. What is the RTP factor of Durga? The RTP stands at 96.00% according to the gamers’ experience. Mythology-based games were always among the most popular and with a growing army of fans. The case could be the same with this one, presuming you have nerves of steel and are able to patiently wait for a big win.